Ballymena United manager Glenn Ferguson. Picture: Press Eye. 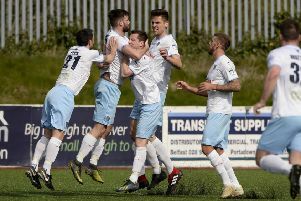 Glenn Ferguson hopes his Ballymena United side can finish a frustrating first half of the season on a high note on Boxing Day. The Sky Blues travel to Coleraine for the annual festive fixture aiming to give themselves a platform for an improved run of form in 2016. “If I was to give a half-term report it would certainly be ‘could do better’,” said Ferguson. “Once again we’ve made too many individual mistakes and conceded too many goals and that has been reflected in the results. “We’ve had to chop and change our goalkeeper and in key defensive positions and we’ll have to do it again on Boxing Day as Johnny Taylor is suspended. “We’ve had a fairly good record in the Boxing Day fixture in recent seasons and we’re all aware of how important a game it is, not only for the fans in terms of bragging rights but also in terms of trying to put a run of results together to move up the table. Ferguson’s preparations have been hampered by a number of injuries to key personnel, with star winger David Cushley struggling to overcome a glute muscle injury which saw him limp off against Linfield last weekend. If selected, it will be Cushley’s first appearance since his decision to join Crusaders on a pre-contract agreement for next season. “Cush would run through a brick wall but, medically, we have to make sure he’s right before we play him. “We’re struggling big time for wide players. “As well as Cush struggling, Leroy Millar is still out with his hand injury and on the other side of the pitch Willie Faulkner and Neal Gawley are out. “Michael Ruddy also picked up a shoulder injury against Linfield - that lad has no luck. “We brought Nathan Hanley in last weekend who hasn’t played since the fourth game of the season, Gavin Taggart hasn’t played in weeks. “We were down to the bare bones and now we’re even further down to the bare bones so we’ll have to get the young lads in this week to have a look at them and see who can do a job,” said Ferguson, who has promoted youngsters Kyle Beggs and Stewart Nixon to his first team panel for the trip to Ballycastle Road. “Coleraine have done really well this season but they might be starting to run into a wee difficult spell of results. “They have a lot of young players who will maybe be experiencing that sort of run for the first time and it will be interesting to see how they react to it but by the same token, they have experienced players like Steven Douglas and Neil McCafferty so it will be a tough test as always,” added Ferguson. * Seven Towers Supporters’ Club transport to the Boxing Day game leaves Henry Street car park at 1.45pm. Anyone intending to travel with the Seven Towers to the County Antrim Shield final on January 12 must purchase a bus ticket from Tommy Patterson (25648732) or Uel Allen (25642903). This also applies to Seven Towers SC members.